Making wine from shriveled grapes dates back at least 3000 years to the Homeric era, especially in the warmer southern Mediterranean wine-growing areas of Palestine, Egypt, Sicily and Greek islands like Santorini (Thera). This most ancient technique today continues to yield unique and famous wines that consumers don't realize reflect millennia of wine-making knowledge! What was delicious, even famous then, continues today, as we find this style of wine among the most compelling today, combining history, rich flavors and deliciousness. Modern technical adaptions have made this style of wine fresher, 'more sensible' for modern tastes which demand livelier fruit. Most of these wines then and now are made through a drying process (appassimento in Italian, passerillage or vin de pailles in French). On Santorini, mature but not over-ripe or dessicated Assyrtiko & Athiri grapes are placed on straw mats in the sun for up to 10 days where the sugars concentrate, the water content of the berries diminishes, and the grapes lose upwards of 50% of their volume. Then the golden wine ages in old barrels up to 20 years in the most sumptuous versions from Argyros Estate. Similarly made and amazingly intense are the fine Passito di Pantelleria wines made from the Zibbibo grape (a Muscat variation) on the black lava volcanic island half way between Sicily and the Tunisian coastline. Donnafugata Ben Ryé is a superb example. Wonderfully rich, grapy, complex and layered flavors result, the wines like nothing else on the planet. This method is still practiced today by traditional-minded producers in Jerez to concentrate Pedro Ximenez grapes, used to make incredibly concentrated wines , but sometimes bottled on their own -the wine resembles brown treacle! More hygienic, controlled drying of grapes in climate-controlled rooms is the norm today in temperate areas. The most important region for this technique is Valpolicella, near Verona, Italy. Here,the Romans made one of their most famous wines, Rhaeticum, a favorite of the Emperor Augustus. For Amarone, or Recioto di Valpolicella, the sweet, original version of the historic wines in the region, climatic and technical aspects dictate more careful and less ‘harsh’ conditions to obtain a balanced wine. Most importantly, the grapes used for drying must be perfectly and uniformly mature, not overripe or already raisining, lowering the risk of volatile acidity and too much potential alcohol. The bunches must be carefully selected to make sure they are not too compact and there are no broken skins; in other words, clean fruit! And let's not forget, these are red grapes! Unlike passito wines made in warmer regions, Valpolicella is further north, the autumn climate usually cold and potentially humid. Sun-drying grapes is out of the question! Producers therefore bring the selected clusters into well-ventilated rooms called fruttai in Italian, where they will be kept up to four months (minimally until December 15 by law) on trays made of bamboo placed on racks (see picture). The appassimento process achieves more than dessication of the grapes it also results in other complex transformations in the grape, such as the decrease of acidity and the modification of the glucose-fructose ratio resulting in the concentration of polyphenols and to a considerable increase of glycerin which contributes to the richness yet balance of good Amarone. The lengthy appassimento process for Amarone requires patience and diligence, monitoring the progress of the fruit and removing any clusters that develop grey rot, or don’t shrivel properly. At the end of the drying process in January or so, the grapes will have lost 35-40% of their weight, with the consequent gain in richness. Traditionally, fruttai were like attics open to the cold autumn & winter air, with hopefully low humidity. If too humid in the late fall, one ends up with more grey rot than noble, ruining the process and necessitating immediate crushing and/or removal of the rotted clusters. For this reason, houses like Masi have created climate-conditioned specially designed rooms to do the appassimento without worry, using computers to create conditions typical of a perfect, dry, cold autumn season needed to make the best vintages. Corvina and Corvinone, the principal grapes (60% at least of the blend) in the Amarone blend, have relatively thin skins. For this reason they are prized as being more susceptible to the development of botrytis cinerea, noble rot, later in the drying cycle. 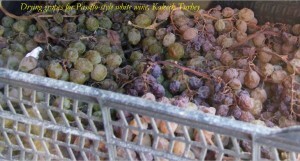 Noble rot further concentrates the grapes. Negatively, it also degrades anthocyanins providing color. Noble rot on red grapes is generally not recommended. In the case of Amarone production, however, under cool, low humidity conditions it contributes immensely to desirable concentrated flavors and more rounded, plush texture. Still, there is a move away from botrytised grapes, in order to retain more color in the wine and purity of fruit flavors. This is a new style Amarone , exemplified by the top wines of Allegrini, Tedeschi and others. We continue to like the more traditional style as produced by traditionally fine producers like Masi, Mazzi and Quintarelli. Other great passito wines like Tuscany's fine Vin Santo are equally worthwhile to search out - and we moderns should appreciate the hard work, low yields and potential for disaster that can ruin a whole year's production when producers make these admittedly expensive wines. They are "originals", and we should drink as much as we can to preserve their existence!